Quotes of BRENT continue to move as part of the correction. At the time of the publication of the forecast, the price of BRENT oil is $ 55.10 per barrel. At the moment, we can expect an attempt to grow and test the resistance level near the area of ​​56.55 dollars per barrel. 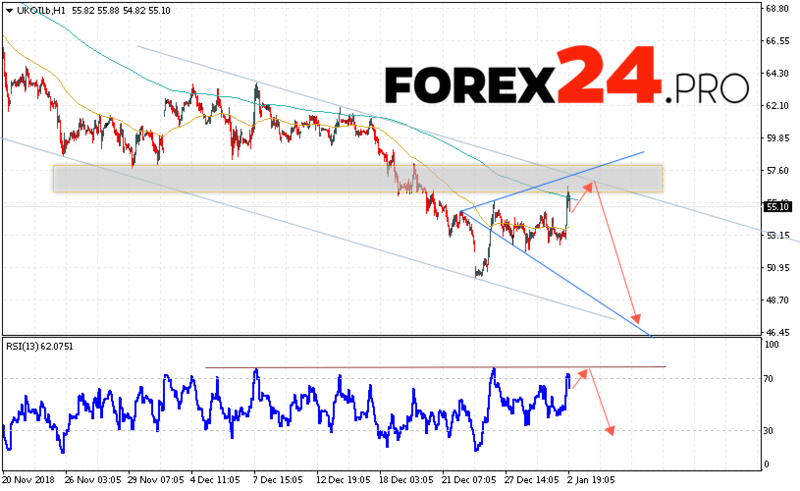 Further, the continuation of the fall of the oil in the region below the level of 46.75. BRENT will test the trend line on the relative strength index (RSI) in favor of lowering quotes and oil prices. As well as a rebound from the upper limit of the bearish channel. Cancellation of the option to reduce oil prices will be a strong increase and the breakdown level of 57.95 dollars per barrel. This will indicate a breakdown of the upper boundary of the channel and the continuation of the growth of quotations in the area above the level of 62.25. Confirmation of a decrease in quotations will be the breakdown of the support area and the closing of BRENT prices below the level of 51.00. BRENT forecast & technical analysis January 3, 2019 imply an attempt to test the resistance level near the 56.55 area. Further, the continuation of the fall with the target below the level of 46.75. Cancellation of the option to reduce the price of oil BRENT will be a strong growth and the breakdown level of 57.95. This will indicate a continuation of the rise of quotations to the area above the level of 62.25.